The dressing is simple to whip up and tastes quite like the real thing. It won't keep as long as bottled dressing but, given how easy it is to make and how normal it is for me to have all the necessary ingredients on hand, I doubt I'll be hitting the bottle again any time soon. I used the bulk of my first batch on this riff on cole slaw. I love cooked Brussels sprouts but not everyone in my house is a fan (of pretty much anything green, but that's another post entirely). I thought if I disguised them as cole slaw, I might be able to sneak them in occasionally. It worked. 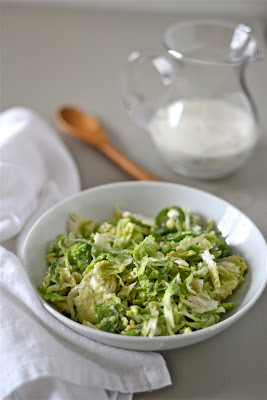 I simply used the slicing blade on my food processor to give the sprouts a more slaw-ish appearance and then tossed them with the ranch dressing and a generous amount of crumbled blue cheese. Easy, cheesy and delicious -- The Ninj's perfect trifecta. Whisk all the ingredients together in a container. Season to taste. This does sound really easy and good! 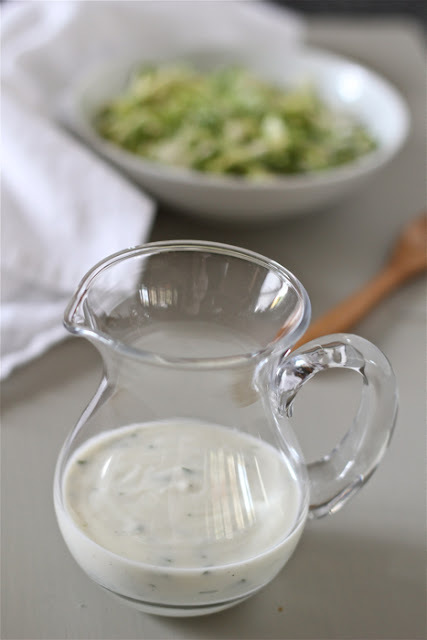 I have a kid who uses ranch dressing on lots of stuff; I'll have to try this version instead. I like a little fresh dill in mine as well (and since my herbs are all still doing well with the weather we've been having in the bay area, this might be on the menu this evening)! I'm jealous -- we've had at least 3 killing frosts already so no more herbs in the garden here in Vermont. Enjoy the dressing!